Merry Christmas from Hungry Souls! We are incredibly grateful for our donors who make our ministry possible. Keep reading for exciting updates and new ways for you to serve and contribute to our mission. Did you know that there are over 100,000 kids in the greater Austin area that don’t know where their next meal will come from? That’s 1 in every 5 kids. Many of these kids rely on free and reduced lunch meals at school, but they don’t have guaranteed meals over the weekends and school breaks. That’s where Hungry Souls steps in. Our feeding program alleviates some of the pressures parents face to provide basic nutrition for their children. Reaching out and serving them with the love of Jesus is our ultimate goal. As always, pray for our families and the 100,000 children without guaranteed meals in Austin during this holiday season. Pray that in 2019 Hungry Souls can develop more corporate partnerships in order to expand awareness of our mission. Hungry Souls is growing the number of families in our feeding program, and because of that, we need to purchase a van to use for food deliveries. Pray that we can raise funds as soon as possible so we can reach more families in need. If you feel inclined to donate towards this cause, please click here. We plan to quadruple in size! You have the opportunity to sponsor a family each month. It takes just $38 for us to feed a family monthly. Your monthly donation will go directly towards fresh, nutritious meals for a local family in need. You may donate individually or partner with your friends, family, or coworkers! Last-minute Christmas gifts with a purpose! T-shirts and coffee mugs are a great way to raise awareness of the hunger problem in our area and spread the word of what we do to fight it. 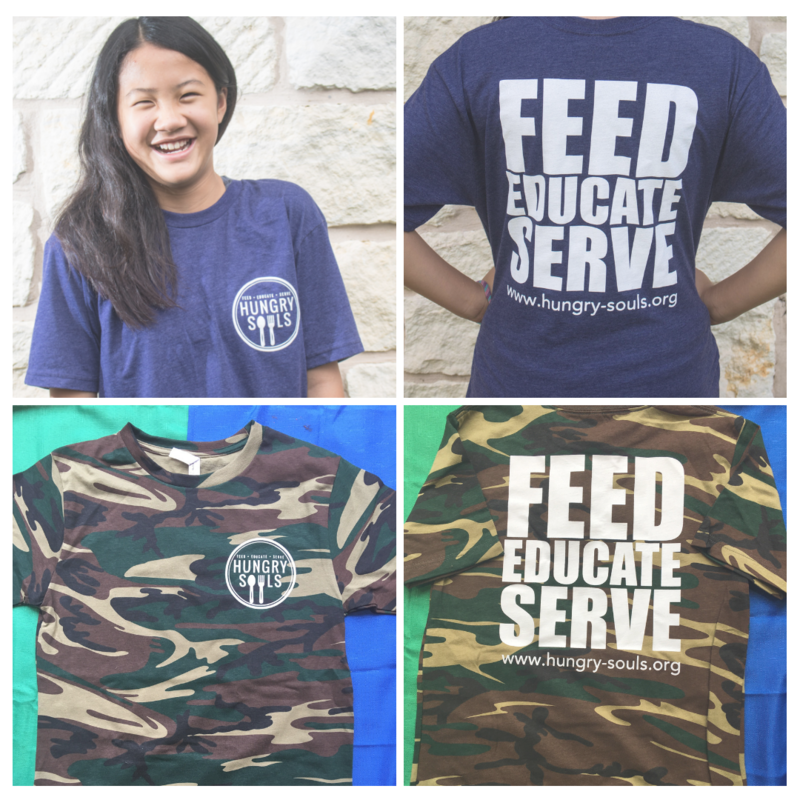 Plus, the proceeds from 1 t-shirt purchase or one tumbler can feed a family for 2 weeks! Our ministry is run by a hardworking, passionate group of people who strive to fight child food insecurity in the greater Austin area. Meet our team of volunteers.